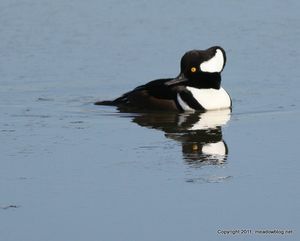 The free talk and slide show on the birds of the Meadowlands, scheduled for Tuesday, Feb. 1, at the Hackensack River Canoe and kayak Club in Paramus, has been postponed until March 1. Additional information on the talk, presented by Jim Wright of the Meadowlands Commission, will be posted on this blog closer to March 1. The group's website is here. unsuccessfully to nail a pheasant on the Kingsland Landfill. Red-tail proceeded to fly up onto a nearby pole and pose for pictures (right). 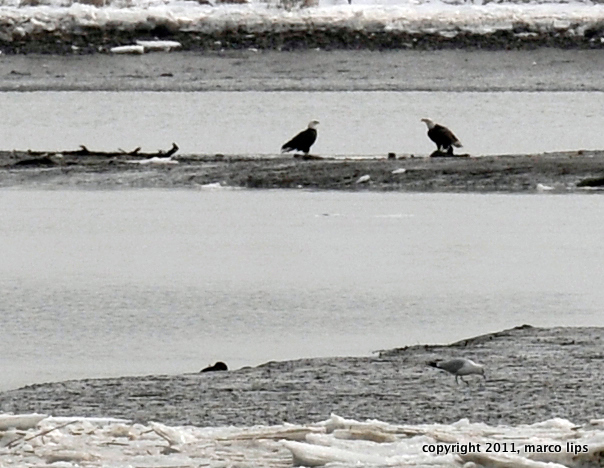 Two Bald Eagles were also way out on the Saw Mill Creek Mud Flat in a distant corner of DeKorte Park. 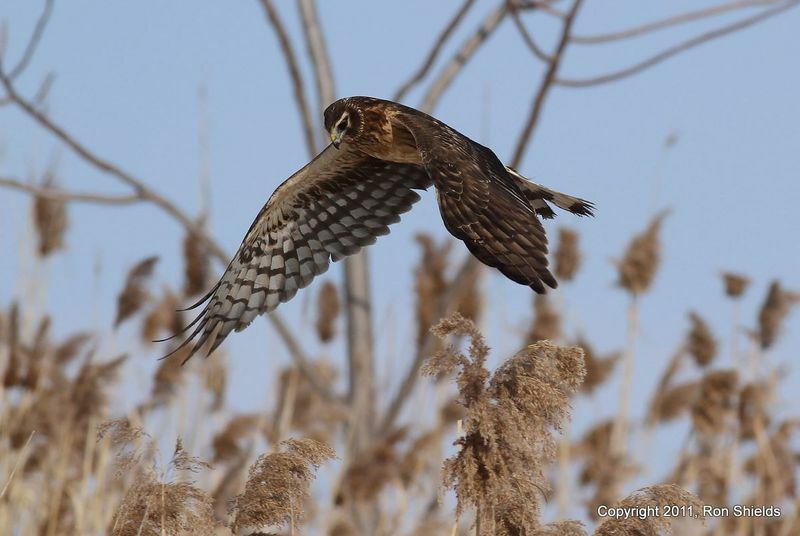 Shot of the Northern Harrier by Ron Shields is from the weekend but just as easily could have been from today. Thanks, Ron! The New Jersey Meadowlands Commission’s Flyway Gallery will host "NatureScapes," an exhibit by members of the Art Center Watercolors Affiliates, in February and March. “NatureScapes” opens on today and runs through Thursday, March 31. A reception for the artists is scheduled for noon to 2 p.m. on Sunday, Feb. 6. 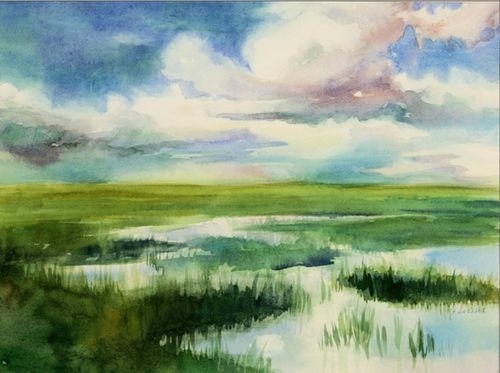 The exhibit features watercolors and acrylics capturing the four seasons by more than a dozen artists including Diane Nafash of River Edge, Marcia Rieff of Glen Rock and Peggy Dressel of Oakland (her watercolor entitled "NJ Marsh" is above). More info and paintings follow. 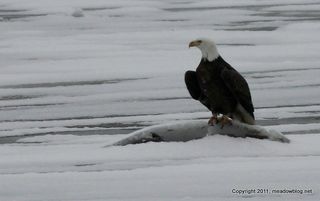 We saw two Bald Eagles yesterday, far down the Saw Mill Creek Mudflats, towards the turnpike, sitting on a muddy patch. First one, and it's a life bird for me, so this was awesome, but then another flew in and joined. Started the morning along Valley Brook Ave. Two Short-eared Owls were hunting around the old ballfield area at 6:30AM. One bird was coursing, while the other was perched for a while on a telephone pole, before coursing. These birds have been present for a full week now. At 6:45AM, a Peregrine came ripping across the construction site…a Cooper's Hawk was then seen flying toward the Turnpike. At 6:48AM, the first Harrier emerged from the Berry's Creek roost…it made a high direct flight to Saw Mill Creek. Ultimately, nine Harriers came out of scattered roost sites…eight brown birds and one gray ghost. There are at least eleven Harriers…if the other two gray ghosts that I observed the other morning are still present. Five Harriers (totally different cohort of birds) were observed hunting Mill Creek Point later. 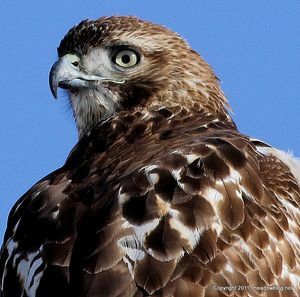 At 6:51AM, the first Rough-legged Hawk was observed, perched. There has been an influx…I had four light morph Roughlegs in view at once and they perched on various things such as Osprey platform, telephone pole, small trees, and a mound of earth. 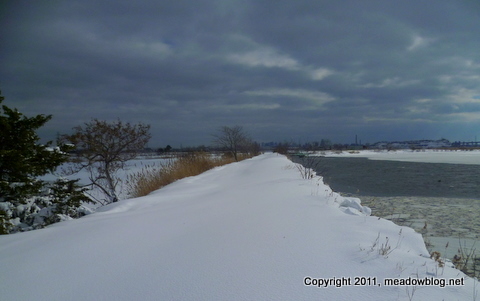 A fifth light morph was observed at Mill Creek Point…it mostly sat on the ice along the river's edge. Started with two light morphs on 12/29…three by 1/15…now five on 1/29. This year's flight a result of heavy snow. Also observed was a Merlin perched on a telephone pole by old ballfield, a Sharp-shinned Hawk hunting along Valley Brook, a Kestrel perched in a tree in a grassy shoulder area by Giant's Stadium, and a 1st-year Bald Eagle hunting Mill Creek Point. And plenty of Red-tails around. Nine Horned Larks flew by old ballfield. Went to Mill Creek Point on lunch hour to look for an adult Bald Eagle seen there in the morning. No luck, but did see a dark-morph Rough-leg, male Golden Eye, a pair of Lesser Scaup and plenty of Red-tails, Common Mergs and Hooded Mergs (above, flying). 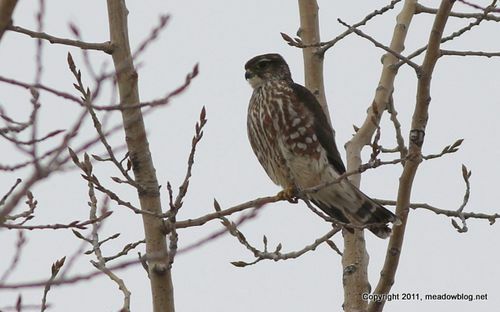 On the other side of the river on Outwater Lane in Carlstadt had an immature Bald Eagle and a Merlin (below). 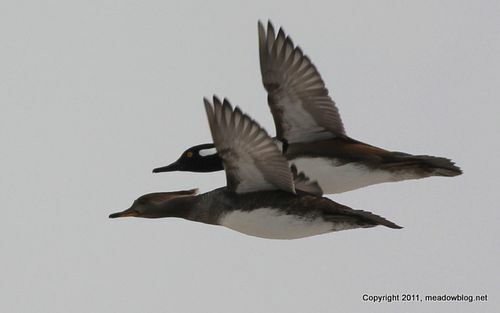 Jim Wright, who keeps this blog for the New Jersey Meadowlands Commission, will present a free talk and slide show on the birds of the Meadowlands on Tuesday, Feb. 1, at the Hackensack River Canoe and kayak Club. The talk will featuring some once endangered birds and some nifty color photos that Jim has taken in the Meadowlands in the past 2.5 years. The emphasis will be on birds that can be seen on the river. Jim will also include photos of other critters he has seen along the river and its marshes — from Diamondback Terrapins to Fiddler Crabs. The meeting begins at 7 p.m. at the Elks Club in Paramus, with Jim's talk to begin around 7:30 p.m. The Paramus Elks Club is located behind Raymour & Flanagan at 200 Rt. 17 North in Paramus, one mile north of Rt. 4; a half mile north of Century Road. It is immediately past Paramus Chevrolet Auto Mall. If you miss R&F's driveway, you can park in Ramsey Outdoor Store's parking lot and walk. Click here for Google map & driving directions. Our Next Walk: Super Bird Sunday! Want to get some exercise, hone your birding skills and win some nifty prizes before settling in to watch the big game on Super Bowl Sunday? The New Jersey Meadowlands Commission is offering a free “Super Bird Sunday II” guided nature walk on Sunday, Feb. 6, beginning at 10 a.m. at the Meadowlands Environment Center in DeKorte Park. The park is located just minutes from New Meadowlands Stadium, home of the 2014 Super Bowl. The second annual Super Bird Sunday, sponsored by the NJMC and the Bergen County Audubon Society, features a 90-minute bird walk on DeKorte Park’s scenic trails – with an added incentive. The first person to see a bird species with the same name as an NFL team – cardinal, raven, falcon, eagle (photographed on Tuesday at DeKorte, above), seahawk (osprey) or “woodpacker” – wins two tickets to a NJMC pontoon boat cruise of the Hackensack River next summer. Went out on cross-country skis around noon to check out DeKorte. Tough getting around without skis or snowshoes. Saw a Muskrat swimming, a Bald Eagle way out on the ice near the Turnpike and 1-E Landfill, a Harrier or two, a Ruddy, a couple of Bufflehead and some Black Duck.